The unprepossessing plant above is Cakile edentula, or the american sea rocket. It might not look like much, but researchers in Canada have made a pretty cool discovery working with it. Apparently, if you place more than one of these plants in a container, fierce competition ensues. Both plants send out roots, vigorously trying to choke out their opponent. Unless, of course, the two plants come from the same mother. In that case they have much more restrained root growth and actually sacrifice individual growth to share resources. That's sibling recognition. In a plant. Wow. 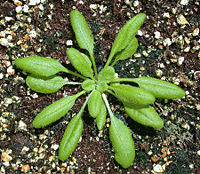 Apparently plant researchers choose their subjects based on their complete lack of visual appeal, because the tiny weed to the left is how researchers at the University of Delaware uncovered the mechanism by which plants can recognize their own siblings. Using some cunning molecular trickery, they were able to prove that the plants determine whether neighboring plants are friend or foe based on the other plant's root secretions. Plants don't have a nervous system. As a matter of fact, you can cut about any piece you like off pretty much any plant and get that piece to grow into a whole new plant. Because of this most people write off plants as stupid, self replicating machines, good only for oxygen and a shelter for wildlife. Hopefully this little bit of information will show that there is much more to our photosynthesizing brethren than meets the eye.